Safely hidden within the estate's enchanted walls, Benella no longer has time to fear her tormentors. She's too preoccupied attempting to determine what makes the beast so beastly. It might be the taxing visits from the aged enchantress who cursed him or his growing vexation at not being allowed to touch Benella. Intended for adult listeners due to sexual situations, violence, and moderate language. I love this telling of beauty and the beast. She is even strong in this story than the one I heard as a child. She faces many hardships because of her sisters and how nice she is. I feel her niceness will be her undoing. She doesn't try to hold the monsters and the would be rapists at fault or try to find a way to stop them. I so happy I decided to pick up this book it was a joy to listen to. The narrator is amazing she brought this tell to life. Grab this book you will fall in love with it! A better edited story would have made this a wonderful listening experience. Would you ever listen to anything by M.J. Haag again? The performance was the only saving grace in a story that went on too long. What character would you cut from Deceit? 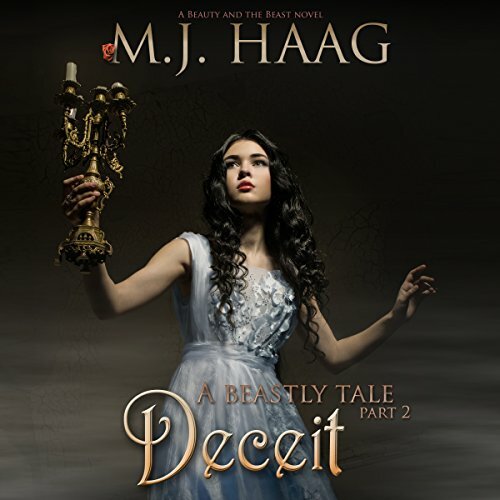 Depravity, Deceit and Devastation, the Beauty and the Beast trilogy by M.J. Haag should have been one book. The story drags on so long; you tire of Beauty, her nasty sisters and her good intentions. There’s so much potential with this story that editing could have fixed. I suffered through to the end but it wasn’t worth it. This series had all of me. It consumed me. The grit, pain, and triumph was all too much while not enough. Unforgettable. I beyond recommend this series to anyone and everyone. Love love love it on to part 3 for me! This is an adult retelling of my fave fairy tale and this installment is the most brutal. Secrets and lies all over the place. Absolutely! Of course, I would recommend listening to Book #1 first (Depravity). This story is so well-written, and Sierra Kline's narration brings the words to life. It a pleasant listening experience. The growing connection between Benella and the Beast. I love her accent, the array of voices she gives to the different characters, and the flow of the story as she narrates. I love this set of audiobooks. Love!!!! Steamiest of the three books! I liked this series a lot but maybe liked this book the most. It was the steamiest of the three books. Not too many sexual scenes, just enough. Well written story and characters are so well developed. A good listen!! Audio brings this tale to life! I had already read Deceit, A Beastly Tale book 2 in ebook but the audiobook is just amazing! It really brings so much depth to this already wonderful story! I can't recommend these books & audio editions enough. Warning: This is an adult retelling of Beauty & the Beast. More ...just more feels than in print. If you could sum up Deceit in three words, what would they be? What other book might you compare Deceit to and why? What does Sierra Kline bring to the story that you wouldn’t experience if you just read the book? She brings the emotions in her voice. I read books emotionally, but there's something about HEARING emotions in a voice. I know I said this made me cry, but I've read all three books and I know how this is going to end. It's worth the tears in the end. I love everything about this book. The characters, writing development and pace. So many twists and turns that lead to a major cliffy. Sierra Kline kicks major mics in this book. She was so on point that I actually thought there was more than one narrator for the book. Kiddos all around for MJ Haag and I cannot wait for Devastation!